Perhaps what we were looking forward to most about our trip to New Hampshire (second to the wedding, of course) was maple syrup season! 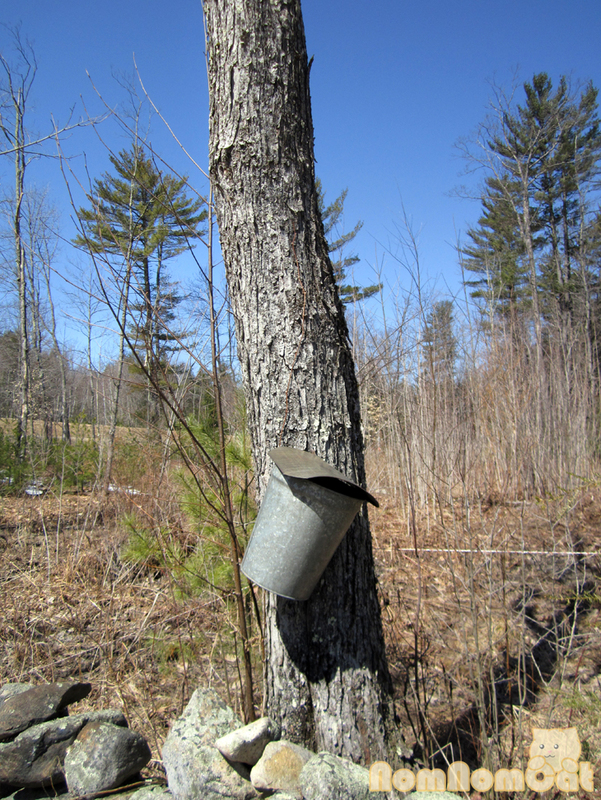 Throughout the month of March, farmers all over NH and Vermont set up buckets to tap the sap from acres of maple trees for weeks at a time. The sap is then collected and boiled down to a concentrated syrup to be bottled in adorable leaf-shaped glass bottles and mini plastic jugs. If you look closely, the sign on the barn door looks reminiscent of something from Winnie the Pooh! 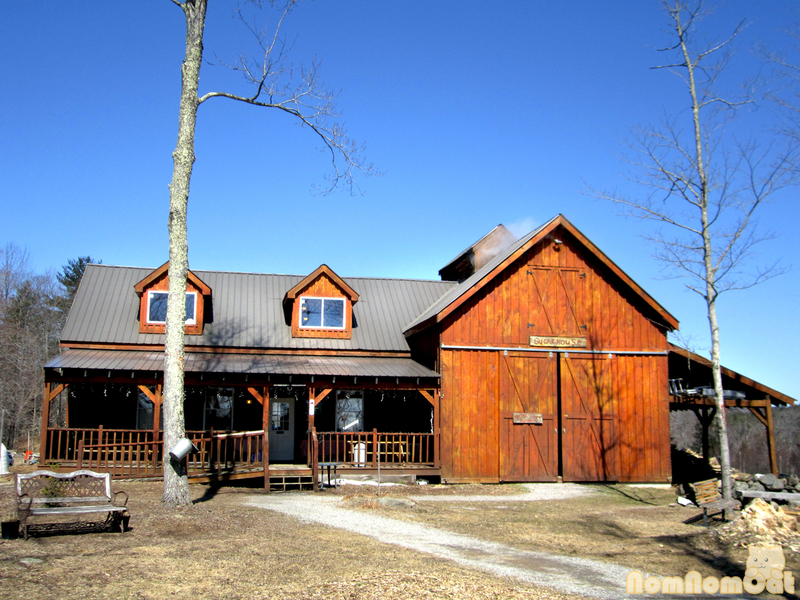 We were lucky to discover that one such farm was situated just down the hill from the Steele Hill Resort — Heritage Farm Pancake House. Open only for breakfast (Wednesdays through Saturdays 8am to noon during maple season), this quaint shop features a maple sugaring facility, pancake-flipping restaurant, and a petting zoo out back. Not being early-risers ourselves, we stumbled in around 11:45am (just before closing) and asked the friendly woman behind the counter whether it was too late for a tour. She invited us to walk right into the maple sugaring area while we were waiting for our breakfast order. Awesome! There we were greeted by Matt, an amicable gentleman who was eager to answer our questions about the process. He even let us venture up to the loft area to see the tank of sap and to get a birds-eye view of the equipment. 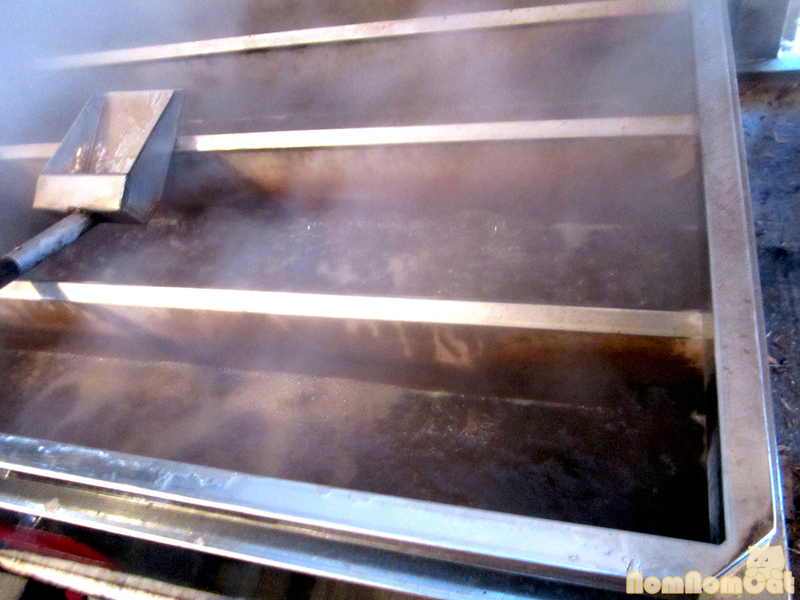 Check out that huge flume of steam on the right — in boiling the sap down into syrup, they end up with a ratio of nearly 50:1. That’s a lot of evaporating! Naturally, when you think about maple syrup, pancakes are one of the first things to come to mind. 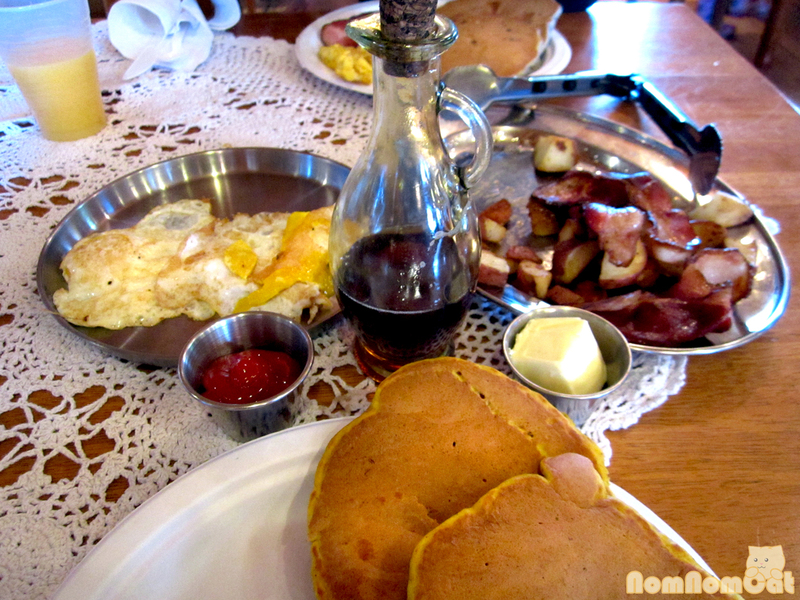 At Heritage Farm, the popular choice is the family-style breakfast. 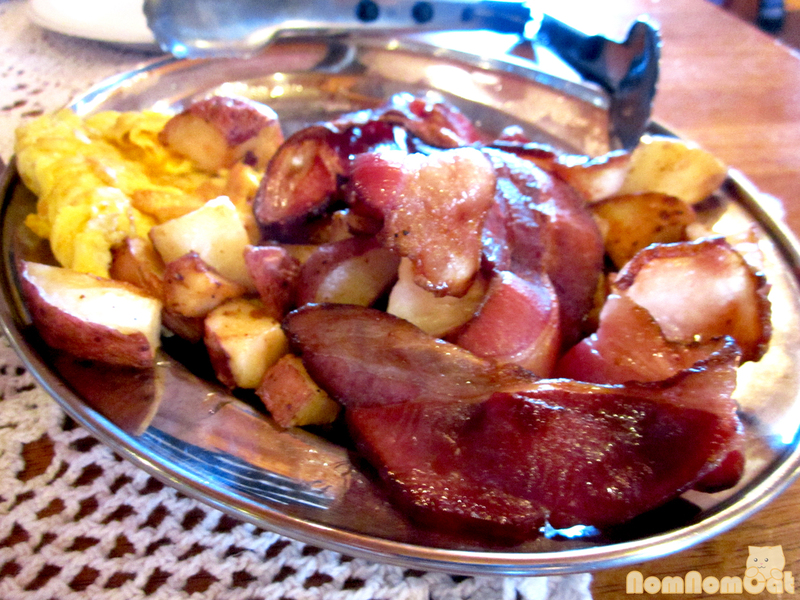 Farm-fresh eggs, locally grown potatoes, homemade pancakes, locally sourced smoked bacon… count us in! Martin’s silky and fluffy scrambled eggs are on the left, snuggled next to the pile of home fries (extra crispy, per our request) and a little mountain of bacon. The thick-cut bacon from The Fox Country Smoke House was toothsome and tender. The potatoes seemed extra earthy and had a wonderful crunch on the edges. 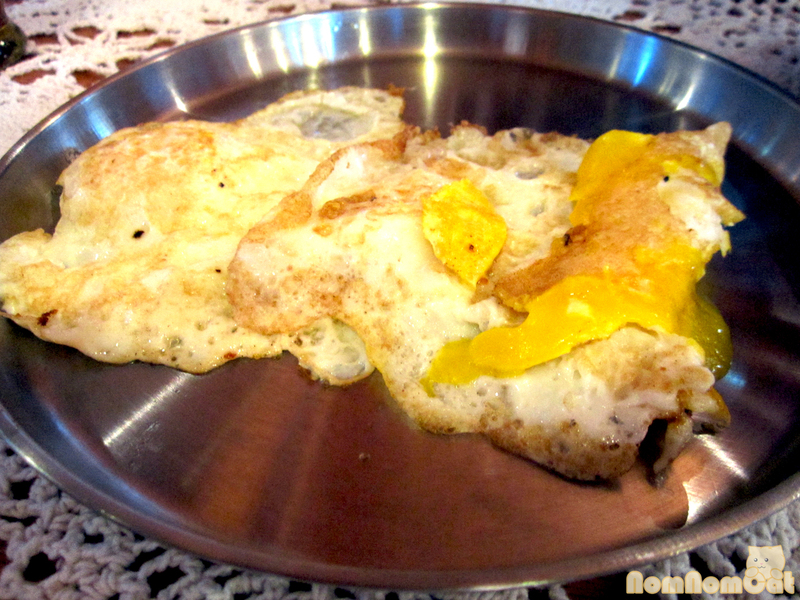 I prefer my eggs sunny side up and runny. I forgot the “runny” part when I placed this order, but no matter – the yolk oozed lusciously and blew every grocery store egg out of the water. It’s kinda hard to find pumpkin pancakes in LA outside of the fall season because that’s when it is trendy and relevant. 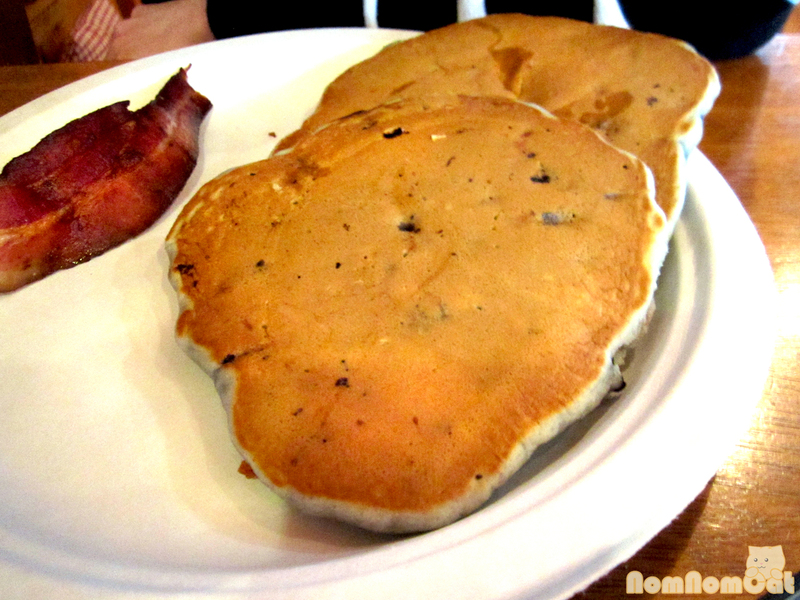 Needless to say, I was excited to find homemade pumpkin pancakes on their extensive list of flavors. 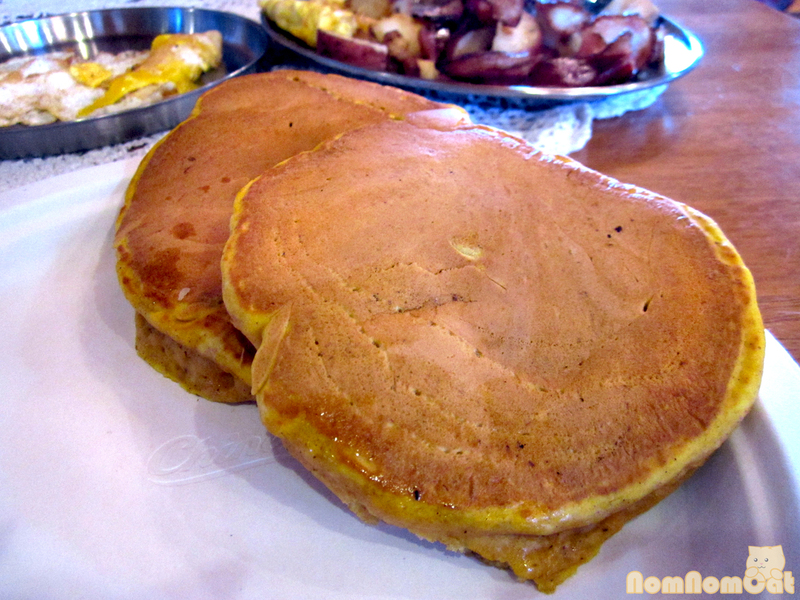 Moist and gooey with pumpkin puree and perfectly golden on the outside, these pancakes were not too sweet, making them perfect when drizzled with their own maple syrup. I was in pancake heaven! Martin has a soft spot for blueberry pancakes, so they were an obvious choice. Filled with the plump purple globes, he seemed to really enjoy his breakfast, not even pausing to share a bite with me! By the time we polished off the last morsel, we were stuffed and oh so satisfied. But wait! I still had not seen any trees with those iconic metal buckets hanging from them. I would miss what could be my only opportunity to see it live and in-person! I panicked, I worried, but then, just as we pulled onto the dirt road, I spotted it. Martin barely slowed to a stop when I hopped out of the car to snap a photo. I could vaguely hear him chuckling at my enthusiasm. If you find yourself in or near Sanbornton, NH, we definitely recommend starting your day off right with a farm-fresh breakfast at Heritage Farm Pancake House. 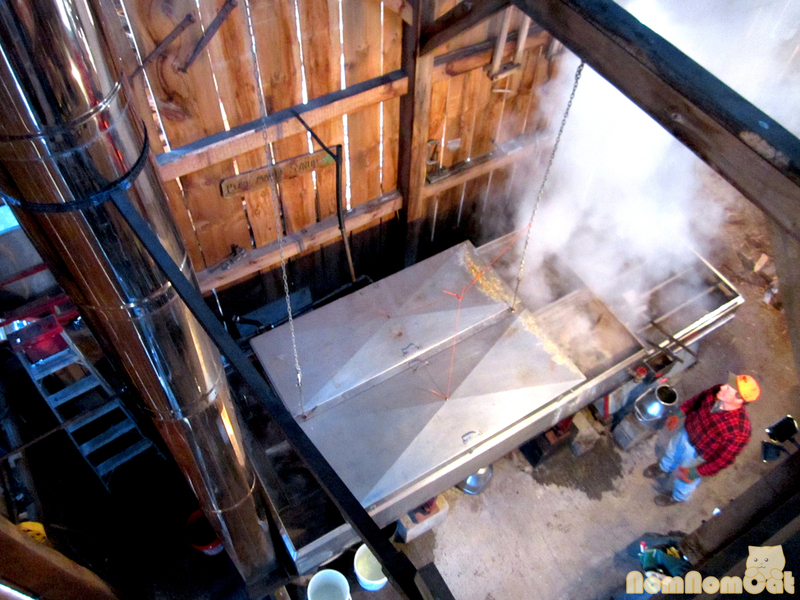 The food is delicious and comforting, the staff are all welcoming and friendly, and there’s nothing like warming your hands by the furnace that powers the sap-boiling equipment and savoring in the sweet-smelling steam as sap turns to syrup before your very eyes. Plus, if you go early enough (unlike us – we turned out to be their last table of the morning), you just might have the opportunity to check out the pasture out back and pet some farm critters!